An edit of a tank that came with the Spa day pack for TS4. 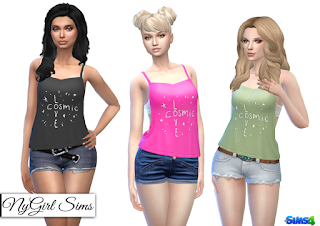 I've added a cosmic love graphic to the from and changed out the bra layer. It is base game compatible. Made from a mixture of TS4 textures. Comes in 24 colors. Where can I find this hair? Love the shirt! !